Photo provided - The ?blue moon? appears to be blue in certain years due to dense particles. But for the most part, its name designates its unusualness. Photo provided – The ?blue moon? appears to be blue in certain years due to dense particles. But for the most part, its name designates its unusualness. Lunar event happens ?once in a blue moon? While a blue moon consistently gives poets fodder and feeds the imagination of stargazers, its presence is a scientific marker for a rotating earth that by its own clock, ignores the Julian calendar. 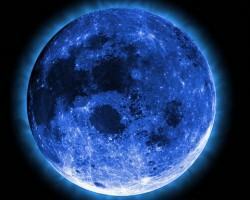 And only once in every 20 years, the blue moon appears on New Year?s Eve, as it will this year. ?The moon is out of phase with the days ? for it to make its complete cycle it?s about 28 days. It doesn?t coincide with our month, and that?s why it is out of sync with our Julian calendar,? explained retired high school science teacher Bob Hartley ?It?s simply the occurrence of two full moons in one month.? The moon brings with it heightened energy for tides and ushers in new weather patterns. This year?s tide will be minus 4.5 feet, the lowest of the month, at 8:18 a.m. on Dec. 31. High tide that day will be 20.8 feet at 1:37 p.m., though it isn?t the month?s highest tide. Traditionally, this is a time to go digging for clams ? even though it is winter. Among the Alutiiq in Nanwalek, it will be time to gather bidarkis, known as chitons in English and as ?u-hee-duks? in Seg?stun. Nanwalek elder Nick Tanape recalled how any full moon brought its own traditions. ?This will last four or five days long, this low tide. This is a time when we were told to start watching your weather,? Tanape said. ?A full moon shows how the weather will be the next 30 days. If it?s nice and clear, no wind, that?s how the month will be. If it?s stormy, it will be stormy.? Tanape said animals are another harbinger of weather. If they are packing on the fur, it will be cold. If their fur clumps off, people can expect a warming trend. After the full moon in January, hibernating bears will birth their young. ?January is the time when they get their deepest sleep,? Tanape explained, adding that the heightened activity during a full moon might disturb them. They sleep best when it has waned. Most people tend to notice a little more heightened human activity as well. In Nanwalek, villagers use this holiday to celebrate sobriety, with activities planned that night at the Robert Kvasnikoff Community Center. They invite others from the region to join them, singing karaoke and eating special foods. ?People get lively around a full moon? maybe it?s like drinking a cup of coffee,? Tanape said. ?It has something to do with energy; you got gravity and energy pulling at you. Even babies get more lively.? Folklore gave each moon a name according to its time of year. A moon which came too early had no folk name, and was called a blue moon. Any full moon has generally had a reputation for causing human havoc, regardless whether it?s blue or not. Still, Homer Police Chief Mark Robl said he doesn?t see any correlation. ?We don?t have stats that change around the full moon,? Robl said. ?But I don?t see that there?s a change in criminal activity.? And while the expression ?once in blue moon? is used metaphorically to describe the rarity of an event, former professional astronomer David Harper of Cambridge, England actually did the math. ?On average, there will be 41 months that have two full moons in every century,? he explained on his Web site. ?So, you could say that ?once in a blue moon? actually means once every two-and-a-half years.? And for those who prefer a more exact calculation, Harper did the rest of the math, too: once in a blue moon = 1.16699016 x 10-8 hertz.